Crochet a funky flower rug with this free pattern from Bernat Yarns. 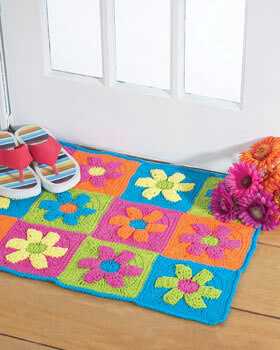 This easy to make rug will add a burst of bright color and a fun, youthful touch to any room in your house. Bernat Handicrafter Cotton (Solids: 50 g/1.75 oz) or yarn of your choice. Main color (MC) (13742 Hot Blue) 3 balls. Contrast A (13712 Hot Green) 3 balls. Contrast B (13628 Hot Orange) 3 balls. Contrast C (13740 Hot Pink) 3 balls. Contrast D (56 Yellow) 2 balls. 5 mm (U.S. H/8) crochet hook or size needed to obtain gauge. Gauge: 14 sc and 16 rows = 4" [10 cm]. 1st rnd: 6 sc in 2nd ch from hook. Join with sl st to first sc. 2nd rnd: Ch 3 (counts as dc). 2 dc in same sp as last sl st. 3 dc in each sc around. Join with sl st to top of ch 3. 18 dc. Fasten off. 3rd rnd: Join color 2 with sl st to front loop only of any dc. **Ch 3 (counts as dc). 1 dc in same sp as last sl st. 1 dc in front loop only of next dc. 2 dc in front loop only of next dc. 5 dc for petal. Turn. Next row: Ch 3 (counts as dc). 1 dc in each dc of petal. Turn. Rep from *** to *** 4 times more. 6 petals. 4th rnd: Join color 3 with sl st to rem back loop of any dc of 2nd rnd. Ch 3. 1 dc in same sp. 2 dc in each rem back loop around. Join with sl st to top of ch 3. 36 dc. 5th rnd: Ch 3. 1 dc in same sp as last sl st. *1 dc in next dc. 2 dc in next dc. Rep from * to last dc. 1 dc in last dc. Join with sl st to top of ch 3. 54 dc. 6th rnd: Ch 3. 1 dc in next dc. *2 dc in next dc. 1 dc in each of next 3 dc. 2 dc in next dc. 1 dc in each of next 2 dc. Rep from * to last 3 dc. 1 dc in each of last 3 dc. Join with sl st to top of ch 3. 68 dc. 7th rnd: Ch 1. 1 sc in same sp as last sl st. 1 sc in each of next 5 dc. *1 hdc in each of next 3 dc. 1 dc in each of next 2 dc. 5 tr in next dc for corner. 1 dc in each of next 2 dc. 1 hdc in each of next 3 dc. ** 1 sc in each of next 6 dc. Rep from * twice more, then from * to ** once. Join with sl st to first sc. 8th rnd: Ch 1. 1 sc in each st around, working 3 sc in corners. Join with sl st to first sc. Fasten off. Using yarn ends from each petal, sew around outer edges of petals. Work as for Motif using MC for color 1, A for color 2 and C for color 3. Work as for Motif using D for color 1, C for color 2 and B for color 3. Work as for Motif using A for color 1, D for color 2 and MC for color 3. Work as for Motif using C for color 1, MC for color 2 and A for color 3. Work as for Motif using C for color 1, D for color 2 and MC for color 3. Work as for Motif using B for color 1, MC for color 2 and A for color 3. Work as for Motif using MC for color 1, B for color 2 and C for color 3. Work as for Motif using A for color 1, C for color 2 and B for color 3. Work as for Motif using D for color 1, MC for color 2 and B for color 3. 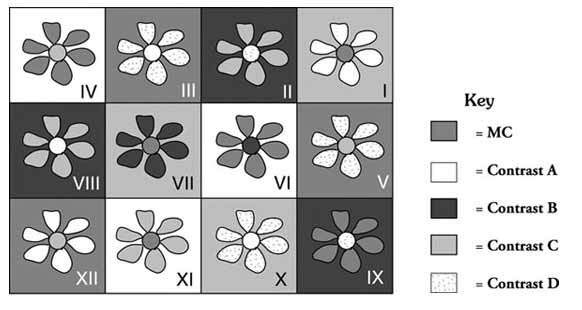 Work as for Motif using A for color 1, D for color 2 and C for color 3. Work as for Motif using MC for color 1, C for color 2 and A for color 3. Work as for Motif using C for color 1, A for color 2 and MC for color 3. Edging: 1st rnd: Join MC with sl st in any corner of Rug. Ch 1. 3 sc in same sp. Work sc evenly around, working 3 sc in corners. Join with sl st to first sc. 2nd rnd: Ch 1. Working from left to right, instead of from right to left as usual, work 1 reverse sc in each sc around. Join with sl st to first sc. Fasten off. I was wondering if there is anyway someone to teach me how to crochet for free? Hi there! I've found the easiest way to learn for free is by watching YouTube videos! I love that you can pause and repeat sections of the video as many times as you like. If you search in YouTube "How to Crochet", an excellent video by Naztazia comes up. I hope that helps! I am about to make this rug (I will need to go DOWN a few sizes in my hook choice to make the rug fit where I want to put it).... but what is a size 7 crochet hook? There is NO U.S. equivalent to a size 7 (the size goes from a 6.5, which is a K to 8.0, which is is an L hook)....? I am in the process of making this rug (bought the kit at yarnspirations.com) and for the life of me cannot get it to look like the picture. I would not rate this as easy, but intermediate and found the pattern confusing. My thought right now is to scrap the rug and use the yarn for something else! I do not understand what Yoh is done. It ways Yoh & draw through 2 loops on hook 3 times, Yet there should be a loop left on hook, I can't understand how this is done. I found a video that a handyman used 100% silicone adhesive...put thick beading around the perimeter edges and zig zagged through the middle and then used a spatula to smooth it out. He let it cure overnight and it left it just tacky enough that it didn't slip anymore. Would, Two sided carpet tape be the answer? I sed the two sided tape and stabelized the Rug. May have repeat the technic,if the Rug has gone thrue the washing machine. Hope it work's for you to? Hello, i made one for my bathroom too but i was wondering how to attach it to a non-slipping rug,, Do you sew it on or glue it, Please give me an idea, thank you. any chances of getting a knitted version of this one? It is pretty, but shouldn't you put a no-slipping backing on this rug? Where is the diagram of the colour layout?